TOPIC: Color/Tone "Read-Only" LOCK for Calibrationists? For those who calibrate, there's something known as ColorChecker (by Pantone and/or some other parties), which some pro's say is more important than common 0-100% colorspace saturation/hue colorspace readings for primary and secondary colors. That means sense because ColorChecker colors/tones are specific ones, the ones commonly utilized during content mastering. For example, they include a set for skin tones, sky tones, etc. Its important to keep those colors accurate, even when messing with ReShade! Would it be possible to create a shader or some kind of a "Read-Only" block on a color or set of colors that would preserve those specific colors or range of colors and prevent them from being affected by any ReShade FX, yet allowing the rest of the color gamut to be changed by whichever ReShade FX? Wouldn't it be great if we could get feature like that? For example, assuming that the game uses some basic skin tone, we could just lock that tone/color down as sort of "Read-Only" entity, proceed to mess with ReShade FX, make whichever changes that would alter graphics, but the skin tone would be preserved. Skin doesn't just use one color/tone. It's a range of colors for people of different races and skin is just one of several important tones/colors that need to be accurate to retain realistic graphics in games that use such colors/tones to create or attempt to create such graphics. A good example would be decreasing vibrance in a game that's overly cartoony, but again, without messing with character faces (skin tones once more in this case). The Witcher 3 is overly cartoony for me and although there was ways to modify lighting per whichver color group, there's no way to reduce overall level of vibrancy without messing up colors of character faces. It would be possible with before-after shader (splitscreen). But note that most games do not preserve proper skin/sky tones, only game I know that has tip-top color grading is Uncharted 4 on PS4. So some adjustment is required prior to rest of the effects, to get colors right. Regarding skin tone, every human has the same pigment, melanin, so every skin tone has the same hue, just different levels of coloring. That is why on a Vectorscope there is only one line for a skin tone, no matter if you're color grading dark or light skin actor. 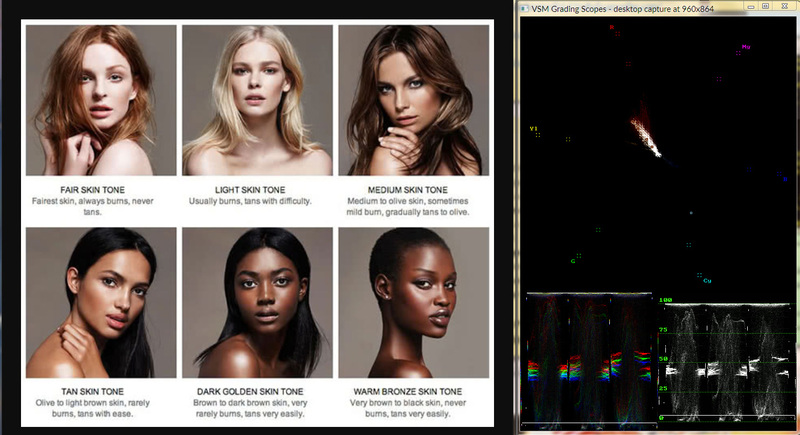 Here is screen-capture vectorscope showing that skin tone is the same. It works nice if you have 2 monitors, on one you run game, and on the other, vectorscope. I thought it would be an easier shader, where you could specify the XYZW of the colors to lock or even better - a range of them. It would be too complicated too because locking specific colors would probably result in banding. And it might be not worth doing because games are far more loose when it comes to color mastering. Look at Resident Evil 2 Remake. They shipped the game with awful gamma defaults and because of that the game lacked contrast, even with power-law gamma 2.4. Changing in-game gamma could achieve proper contrast at the cost of messing up grayscale and colorspace accuracy. They did the same in Resident Evil 7, but I think the Gold version had better gamma defaults.